Born February 27 1903 in Hunan Province and passed away on March 16th, 1961 in Shanghai., he participated in the Long March as a shy, boyish man of 31. He had been a cadet at Whampoa Military Academy under Chiang Kai-chek and became one of the Red Army's most capable commanders. 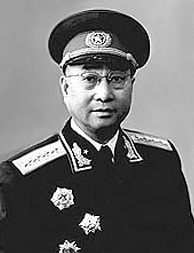 Chen Geng was conferred the rank of army general in 1955. 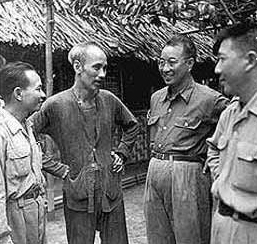 Chen Geng (third from the left ) was chatting with Vietnamese President Ho Chi Minh(second from the left) in July 1950. Chen Geng(left)visited an signal communication equipment exhibition in April 1957. 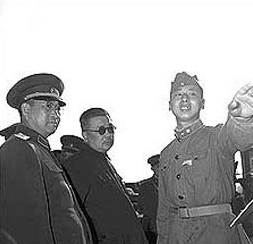 Leaders of the Joint Command of the Chinese People's Volunteers and the Korean's People's Army . 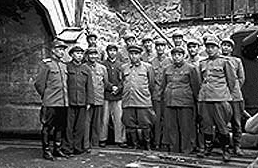 The third from the left in the front row is Chen Geng, the sixth from left is Peng Dehuai and the fifth one is Kim Il-sung. 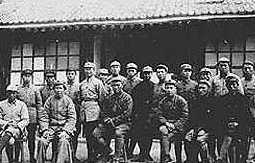 Mao Zedong (front second from left), Zhu De (front third from left)were together with some students at the Red Army university,the 4th from left in the rear row is chen Geng.